The journey up from London shouldn’t take that long, right? Just a couple of hours. As long as we leave by 12pm we’ll be fine – or so we thought until we realised that registration would close at 3pm. Thankfully despite the traffic, I made it to registration just before 3. But my rush didn’t end there – as I only had an hour to rack my bike in T1, which was 10 miles away. Thankfully I made it to T1 in time – there was some serious carbon on show on those bike racks. Not sure if those bikes see light more than 1 or 2 days a year but they looked fast! I’m not sure if you can tell but the day before race day was a little bit rushed and stressful. So much so that I’d forgotten to put any food or water bottles onto my bike. Hence the next morning we had to wake up at 4.30am – to drive to the Shugborough estate so I could catch the shuttle bus to put some water and food on my bike. I think this was probably a good idea anyway, I saw at least one person whose tyre had popped while racked and had to do a hasty repair. Luckily, tyres intact I was able to sellotape my carefully selected nutrition (soreen banana, Isogels) to my bike without any delay. I also added a few things I hadn’t remembered to put in my T1 bag – like my cap and sunglasses. Time to swim! I lined up with the other pink hats towards the front of the pack. We were led down a jetty to the start – it was a rolling start so two at a time we entered the water. Out to the first turn I felt good, trying to keep my stroke smooth. I quickly realised that there would be a lot of sighting needed on this course mostly because there were so many hats to swim around! I was passing the slower swimmers from the green, and even purple waves. After the second turn I noticed out of the corner of my eye that I’d picked up a pink hat tail swimmer cheekily drafting behind me. Some added motivation to go fast as I tried to leave him behind! I’m not sure if I succeeded but I think it helped with my motivation. I only got kicked once, as I tried to pass a guy doing breast stroke. Which is a good number of times to be kicked considering how crowded the swim was. I finished in 33m48 for the whole course – really happy with this pace since I hadn’t raced or sighted properly for a long time. 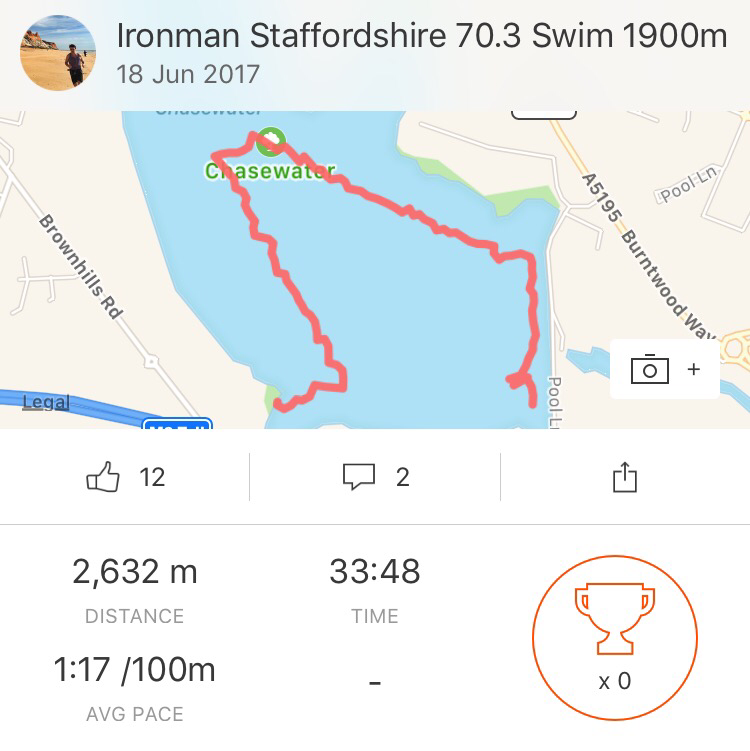 I think on reflection I could have done more open water practise, but I concentrated more on bike training since I hoped it was the place I could make the most improvements. That was a long run after the swim into T1! The organisers had laid down some rubber matting to protect our bare feet on the way to transition, but I still somehow managed to stub my toe. After swimming for that time, running felt like such a strange position to be in. It was like there was no blood in my legs, and at the same time the blood was rushing out of my head. That probably explains the stubbed toe. I ran down the narrow passage with supporters on one side and into the blue bag tent. Wetsuit off, trisuit pulled all the way on, bike shorts for extra padding on, helmet on, race belt on, chug a gel done, extra gels in trisuit pockets and then I stuffed everything I didn’t need into the blue bag and threw it to the volunteers on my way out of the tent. I carried my shoes to my bike. I’ve not managed to master the running start to mount the bike yet so I actually ran the last bit of transition with my cycling cleats, then mounted at the designated mount line. I really enjoyed the bike course – so much fun to be able to go full speed without worrying about cars or where I was going. 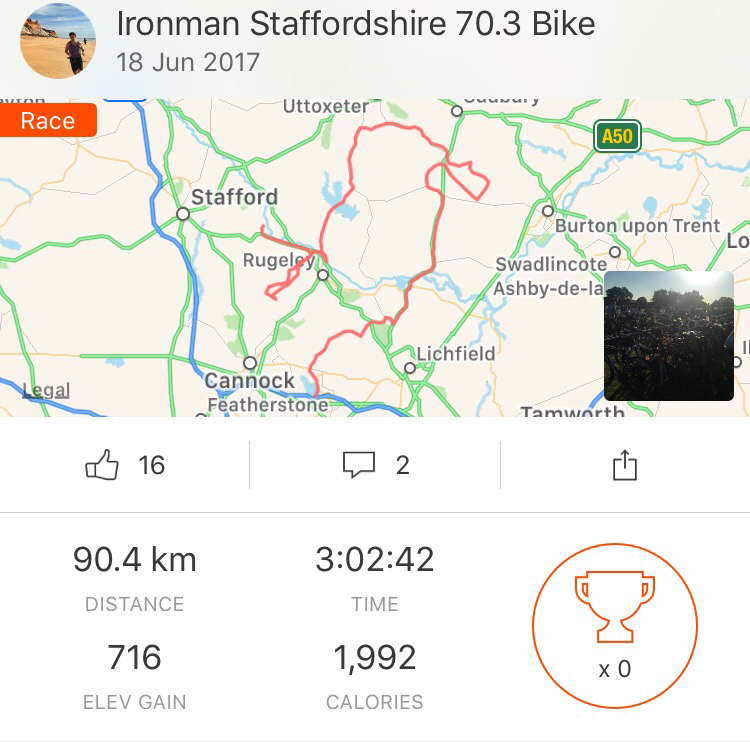 It started with a section over the dam of Chasewater reservoir that was really bumpy, I was praying to avoid a puncture already. Afterwards, it was rolling hills tending to be small and momentum carried me along for a lot of them. I found that I was mostly passing people throughout, and the people who were overtaking seemed to have very expensive bikes. A good sign! For my pacing, I really expected to be somewhere between 25-30km/hr as an average, it was really quite early on that I realised I was at the top end of this range. I finished in 3h02 offical time 3h04 (not sure where these extra minutes came from, my time was recorded on my Garmin). This meant that I was averaging 29.7km/hr. The course was hilly – 716m according to my Garmin – I was really happy with my bike effort. Getting off the bike was where the trouble started. Anyone who has done any kind of triathlon will know that running after cycling hard, is really difficult. It surprised me how tired and tight my calves felt. I thought I didn’t use them that much while cycling. My legs felt dead and heavy but I made it through the red bag tent without a hitch and started on the run. The course was 3 laps, and before the run had even begun, I knew I wasn’t going to enjoy it. I’ve never really enjoyed running multiple laps in a race – although I do it all the time in training. I tried to think positive on the first lap just see what’s going on, second lap just concentrate on getting more than half of the run done, third lap just finish. Did it work? Hmm till about halfway. Three lap courses are great for spectators though and I got to see my wife and parents 3 times for emotional support, which by the third lap, I definitely needed. There were aid stations ever 1-2 miles and I found I was walking at every one, epecially the one strategically placed at the top of the steepest bit of climb. There were cups of water, electrolyte and pepsi. Wait a second, pepsi? On a triathlon course? What madness is this. I avoided the cups of death but drank water and electrolyte at every station. They also had bananas, gels, bars and best of all, on one station, ice cubes. 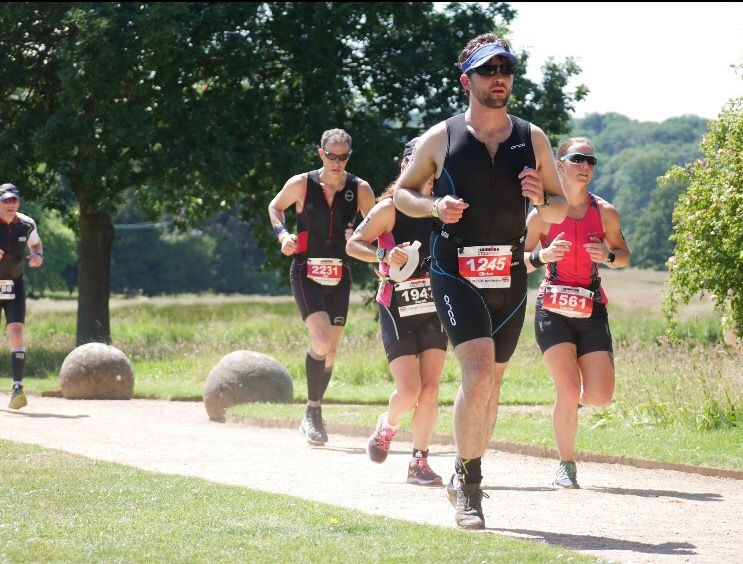 It was so hot, on my third lap, I took some of the cup of ice cubes and held them in my hands to try and cool down my body temperature – the most comfortable I felt in the whole run. Each lap passed the turn to the finish line first, there was a tempting sign directing either finish (shade and rest) or another lap (heat and more running). 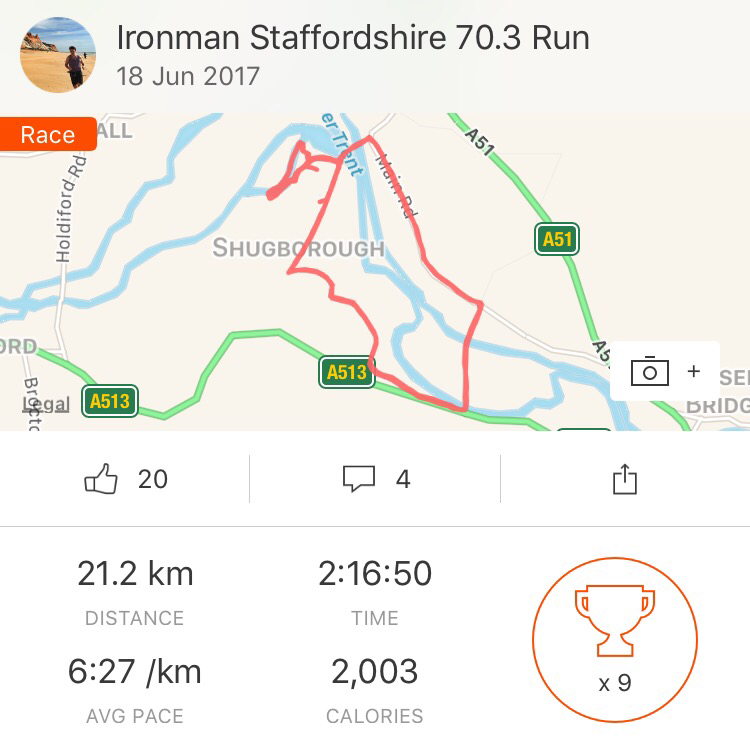 The course then went round the back of Shugborough hall, through the gardens passing over a river and then out of the estate to a local village. This is what I will remember from now on as hill village as it was the place where the largest hill on the lap was. It was impossible to tell how I was doing compared to other competitors, not only had we all started the swim at different times, but the runners around me also could have completed any number of laps. Overall it was actually quite a nice run, just take out a few of the hills and drop the temperature a little bit and I’d have loved it. Final time: 6h06 so close to sub 6hrs! I probably could have done better in transitions 1+2. A finishers medal, t-shirt (white L) then a huge selection of food, I’ve got to say that pulled pork with stuffing and apple sauce was amazing. They also had different kinds off fruit and, more pepsi? Just what triathletes need to replenish. 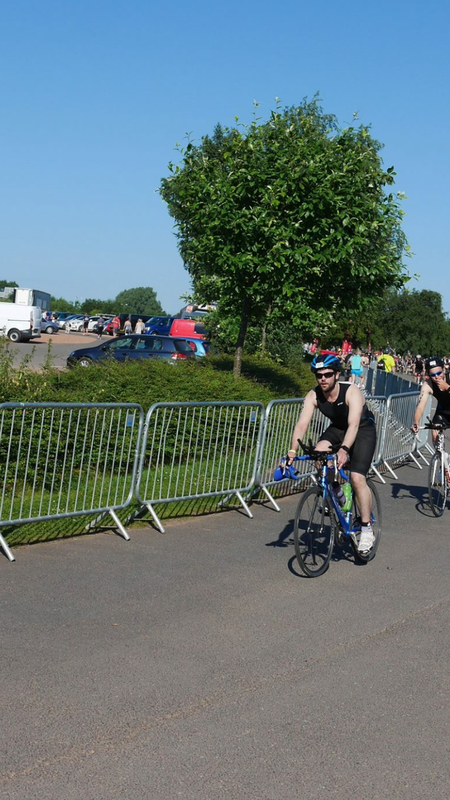 Overall, a fantastic day, smashed the swim, smashed the bike, but the run smashed me. Very difficult with the heat and general exhaustion. Next time, I will do better! That Vitruvian man in September looks very tempting already, and the ache from my legs has barely faded.